Blue Sapphire (Neelam) should never be worn without a trial. An unblemished blue Sapphire if it suits the wearer can removes poverty and provides health, wealth, longevity, happiness, prosperity, name and fame. It also restores lost wealth and property. A blemished Sapphire (Neelam) is the cause of many miseries. If the Sapphire (Neelam) has white lines on it, it is bad for the eyes. The whitish (milky) stone brings poverty. A cracked blue sapphire brings accidents to the native. The dual coloured stone may cause troubles from the enemy side. The dull coloured Sapphire (Neelam) causes distress and worries to nears and dears. There are also following beliefs about this stone. 1. If the Sapphire (Neelam) is put in water and the same water is used to wash the scorpion bite, the effect of the poison is removed immediately. 2. If the Sapphire (Neelam) it is worn as a talisman, it gives protection from evil spirits. 3. The Sapphire forewarns its owner by changing its colour if there is any conspiracy or threat of an attack on him by his or her enemies. Who Should Wear A Blue Sapphire (Neelam)? Blue Sapphire (Nelam) is the gemstone ruled by Saturn. Suitability of Blue Sapphire According to All Ascendants (Lagnas). If our readers want to know about their Ascendant (Lagna), they may provide us with their birth details, namely date, place and time of birth Please click here. Saturn is the lord of the tenth and the eleventh bhavas (houses). Both of them are auspicious houses. Saturn on account of occupying the lordship of the eleventh house, which is not considered a good house, is not considered an auspicious planet for Aries natives. Even then if Saturn is posited in the 2nd, 5th (in his sign of exaltation), 9th, 10th (in his own sign) and 11th (in his own sign) Blue Sapphire can be worn for deriving benefit in the major period of Saturn. Saturn is a yogakaraka planet being lord of the ninth and tenth houses. Consequently, if the native of this Ascendant wears a Blue Sapphire he will always enjoy happiness, prosperity, name and fame, advancement in the professional sphere and favours from Government. The results will be more powerful if Blue Sapphire is worn in the major and sub periods of Saturn. It will prove more advantageous to wear Blue Sapphire with Diamond the gemstone of Venus, the lord of this Ascendant. For the Gemini Ascendant Saturn is lord of the ninth, a trine. Therefore Saturn is an auspicious planet for this Ascendant. It will, therefore, be prudent and profitable for the native to wear Blue Sapphire in the major period of Saturn. Mercury, the lord of this Ascendant, is a friend of Saturn. Therefore, wearing of an Emerald, with Blue Sapphire will prove more advantageous. For the Cancer and Leo Ascendants Saturn will respectively be the lord of the seventh eighth, sixth and seventh houses. The sixth and eighth are inauspicious houses and the seventh is a death inflicting (maraka) house. The lords of these Ascendants are also enemies of Saturn. The natives of these two Ascendants should never wear a Blue Sapphire. For the Virgo Ascendant Saturn is lord of the fifth and the sixth houses. Because of lord of the fifth, a trine, Saturn is not totally an inauspicious planet for this Ascendant. Consequently, the natives of this Ascendant can wear Blue sapphire in the major period of Saturn. For the Libra (Tula) Ascendant, Saturn is lord of the fourth and the fifth houses and is, therefore, a Yogakaraka planet. Venus, the lord of this Ascendant is also a friend of Saturn. 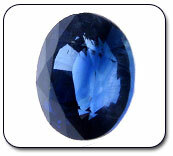 Consequently the native of this Ascendant will enjoy very beneficial results by wearing a Blue Sapphire. The wearing of a Blue Sapphire during the major period of Saturn will prove very profitable. The benefic effects of the Sapphire will be increased if it is worn along with Diamond, which is the gem stone of Venus, the lord of this Ascendant and Emerald the gem stone of Mercury, the lord of the ninth house. For the Scorpio (Vrischika) Ascendant Saturn is lord of the third and the fourth houses. Saturn is considered as a neutral planet for this Ascendant. Still if Saturn is in his own sign or in fifth, ninth, tenth house (bhava), Blue Sapphire can be worn, in the major period of Saturn. For the Sagittarius (Dhanu) Ascendant Saturn is lord of the second, the death inflicting house (maraka house) and the third, Moreover, Saturn is considered an enemy of Jupiter, the lord of this Ascendant. Consequently it will not be advisable for the native of this ascendant to wear a Blue Sapphire gemstone. It can be worn if Saturn is posited in the Ascendant. For the Capricorn and Aquarius Ascendants Saturn is the lord of the Ascendant and Blue Sapphire should be worn by the natives of these Ascendants as a protective charm all their life. It will bestow good health, long life, prosperity, wealth, happiness and success in their ventures. The effects of Blue Sapphire birth stone will be strengthened if a Diamond, the gem stone of Venus, who is a yogakaraka for these two Ascendants, is worn along with it. For the Pisces Ascendant Saturn is lord of the eleventh and the twelfth houses. Saturn is, therefore, not considered auspicious for this Ascendant. Moreover, Saturn is an enemy of Jupiter, the lord of this Ascendant. Still if Saturn is in his own sign in the 11th or in the Ascendant, Blue Sapphire can be used with advantage in the major period of Saturn. Another famous Indian classical work 'Phaldeepika' has also subscribed to the above view. These gem stones are called Nav-ratnas (Nine Gems). Gemology although not considers them all to be precious stones, but being related to the planets, they are of considerable remedial use. Vedic Astrology since the ancient times has always believed in the healing powers of the gemstones. Here we are going to learn about the various precious as well as semi-precious stones, and about differentiating between auspicious and inauspicious stones as well as the planets and diseases associated with a stone and its curative powers. We will show you which stone is suitable for you according to your lagna (ascendant) and the position of the planet associated with the stone in your kundali (chart). We have also provided you with a chart that tells you what gemstone to wear based on your Nirayana Sun sign. We have also parted with information on the rituals believed to be necessary to purify the gemstone before wearing and the mantra associated with that gemstone. Before wearing a stone, we must know whether to wear the stone for an ill-placed planet or a well placed one?